Yet, other cats seem determined to explore the great outdoors. Maybe yours is one. These are the cats that stand by the door and meow or scratch it to pieces wanting to go out. Other cats have exhibited destructive behaviors when their owners tried to turn them into an indoor cat against their will. Still others were stray cats you adopted (yay!) who would like to maintain an indoor/outdoor way of life. For safety’s sake, we recommend helping your cat find the indoor environment fun and curbing their outdoor ways. The key is to make the inside interesting! Every cat is different and some will be easier to transition than others so use these as guidelines to help your kitty make the transition. If your cat has gotten in the habit of going outside, then remember that changing a habit can take some patience but it is possible. Feed Indoors - Start feeding your cat inside if you don’t already. This way, your kitty will associate coming inside with good things happening. If your cat does come in to eat and then wants to go back outside, specialists recommend delaying the exit. You may be able to distract your cat with games (see below) to take their mind off the outdoors. Gradually, you’re able to keep them in for longer and longer times. Add a Scratching Post and Litter Box - Outside, your cat may sharpen his claws on trees or pavement and use the bush as a litter box. Obviously, you don’t want your cat using your furniture as a scratching post or the corner of your living room as a bathroom, so you’ll need to make other arrangements. 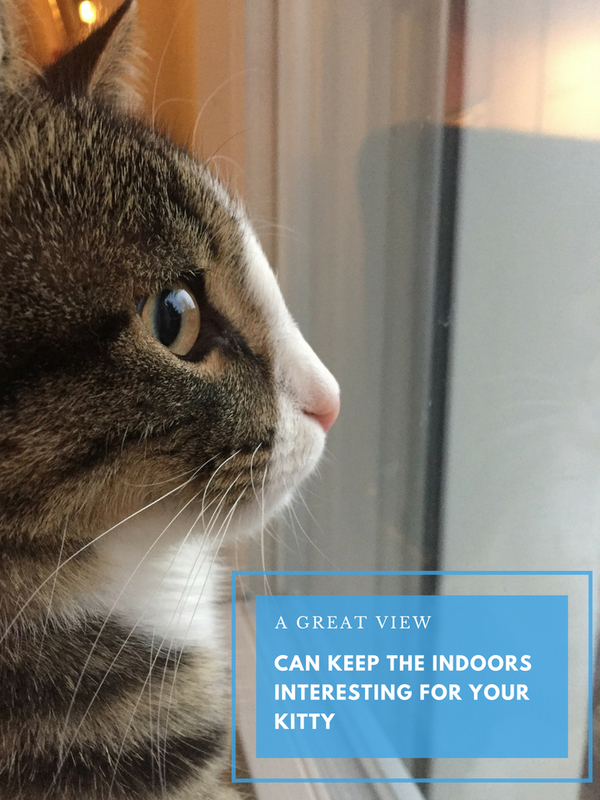 It’s a good idea to add these things while your cat is still in the habit of going outside. Show them how they work and encourage their use. Create Kitty Hideaways - Your kitty has his favorite hiding spaces outside. You can offer some indoors. Empty Amazon boxes work great. So do paper bags. (It’s amazing what cats will want to curl up in.) Your cat may also choose a closet or want to hang out under the bed. It’s perfectly natural for cats to seek out a hideaway and it’s nice to give them options. Give Them a High Perch - Cats also love sitting high above and surveying the room. If they don’t already have a good spot that provides them with the perfect view from above, then give them one! Kitty condos work well, some cat lovers have even installed shelves on their walls to serve as kitty seats. If you have younger cats, they’ll love to climb. Play Games - Balled up paper, dangling strings, these are classic games cats love. They especially enjoy it if you play with them. Get a Birdfeeder - Cats who like to go outside are often hunting wildlife, so create opportunities for your cat to fulfill that hunting instinct without killing baby birds. A birdfeeder outside a window where your cat has a safe perch gives them the chance to enjoy watching the birds and keeps the birds safe. It’s a fact that indoor cats live longer, so remember that you’re doing this for the health and well-being for your kitty. Make the indoors interesting, play with your cat and give him attention and soon, he’ll stay in because he wants to be there. If you have any questions about your kitty’s health, please be sure to contact us!